A Lagos State High Court in Ikeja on Thursday ordered the police to produce in court a 20-year-old man, Ebi Tosan, nabbed by the force in connection with the March 12, 2015 robbery of the Lekki branch of First City Monument Bank.The deadly gang, which Tosan allegedly belonged to, reportedly killed about five persons, including three policemen and a fish hawker, before carting away about N15m belonging to the bank. The robbers, who reportedly stormed the bank in broad daylight, wearing military uniform, were said to have engaged the police in a gunfight on Admiralty Way, Lekki, Lagos State, for about 30 minutes before finally escaping through the lagoon in a speed boat. 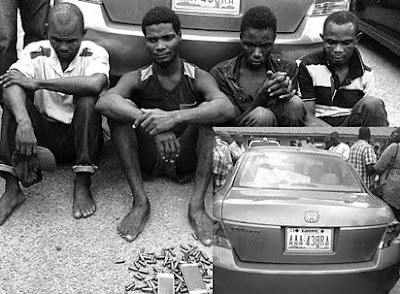 The police, however, tracked down and apprehended four of the suspected members of the robbery gang on April 5, 2015. Those arrested and paraded by the police were, Tosan, Duke Odogbo, 38; Lawrence Kingsley, 31; and Ekelemo Kuete, 30. But Tosan had headed for the court seeking a declaration that his arrest, torture and continued detention by the State Anti-Robbery Squad, Ikeja without admitting him to bail was a violation of his human rights, preserved by sections 34(1)(a), 35(1)(4) and Section 41 of the 1999 constitution.The suspect who urged the court to order the police to immediately release him on bail, is also claiming N100m damages against the police for what he termed unlawful detention and torture. At the resumed hearing of the suspect’s fundamental rights enforcement action on Thursday, Justice Iyabo Akinkugbe reaffirmed an earlier order made by Justice Lateefa Okunnu on July 9 directing the police to produce the suspect in court.